BRATS RAW is a series of uncut interviews from the original movie, "BRATS: Our Journey Home." We have so much wonderful footage, full of poignant and provocative moments, it seemed a shame to waste it. Every time we screened the original documentary, the audience said they wanted more - so here it is - the first segment of BRATS RAW! In segment one, American icons Kris Kristofferson and General Norman Schwarzkopf continue the heartfelt journey into the strange but interesting life of an American military "brat." Both were brats themselves - the sons of soldiers, who also raised their own brats. Hear some of the challenges they faced as military brats. What happened when Kris Kristofferson told his mother he was turning down an assignment to teach at West Point and moving his family to Nashville to become a songwriter? What was it like for General Schwarzkopf to live with his father in Iran just after World War II? BRATS RAW gives you a rare glimpse into personal lives of two military brats who have shaped America's culture. Click picture above to see the trailer! Our mission at Brats Without Borders is to explore what it means to be the child of a Military Member - the good, the bad, the ugly, and the beautiful. To understand who we are and where we're "from." To help current brats prepare for the world ahead of them. To help teachers and parents understand their children a little better. Everybody's story is different - but everybody's story is the same. We hope you enjoy this first segment of BRATS RAW! 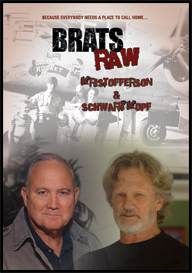 ORDER YOUR COPY of "BRATS RAW: Kristofferson & Schwarzkopf!"